This GY-BMP280-3.3 pressure sensor module Arduino tutorial shows how to connect a pressure sensor module to Arduino and how to read pressure and temperature from the device. Either I²C or SPI interfaces can be used to connect the module to Arduino. The module operates from 3.3V and is not 5V tolerant, so it is important to wire it correctly to 5V Arduinos using level shifters and 3.3V for power. 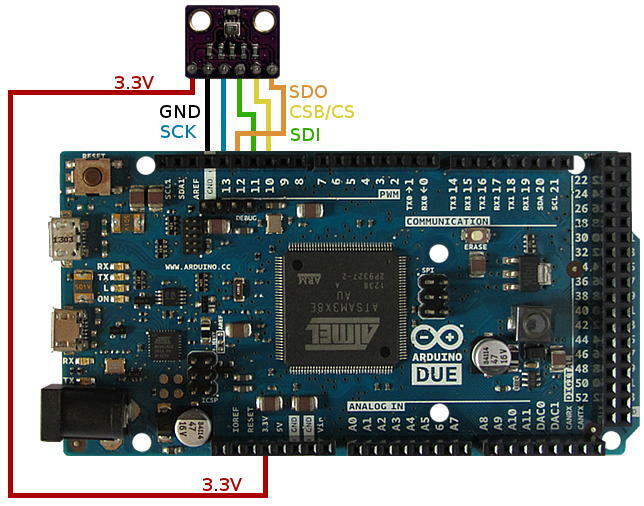 To use the pressure sensor module, a library must be installed in the Arduino IDE. This is easily done as the library can be installed from within the Arduino IDE without the need for a complicated manual installation. The image below shows the pressure sensor module used in this tutorial. It contains a BMP280 sensor from Bosch that can measure both atmospheric pressure as well as temperature. Also see the GY-BMP280-3.3 pressure sensor module pinout for pin numbering and circuit diagram of the module pictured below. This tutorial shows first use and testing of the GY-BMP280-3.3 pressure sensor module so that you will know whether the device is working or not. The video below shows an Arduino Due running the test sketch and displaying pressure, altitude and temperature. Unlike some other modules that use the same BMP280 sensor, this module does not have a voltage regulator or level shifters for easy use with 5V systems. It is a 3.3V only module. The easiest way to operate it is to use it with a 3.3V Arduino such as an Arduino Due, Arduino Zero or Arduino M0. Software SPI refers to using the Arduino SPI driver to emulate SPI hardware using "bit banging". This enables a SPI device such as the pressure sensor to be connected to any Arduino pins. Hardware SPI refers to using the actual hardware SPI device of the microcontroller chip on the Arduino. Specific Arduino pins must be used for hardware SPI. A GY-BMP280-3.3 pressure sensor module can be used directly with a 3.3V Arduino such as an Arduino Due. The I²C wiring is as follows. Below is the wiring diagram as described above. A bidirectional level shifter module can be used to connect the 3.3V GY-BMP280-3.3 module I²C pins to a 5V Arduino such as an Arduino Uno or Arduino MEGA. Power for the pressure sensor module must be taken from the Arduino 3.3V pin. Alternatively a transistor such as a 2N7000 N-Channel MOSFET can be used to make a bidirectional level shifter as shown below. In the above circuit, for logic 1 levels, when 3.3V is applied to the left 3.3V_Logic pin, 5V appears on the right 5V_Logic pin. For logic 0 levels, when 0V or GND is applied to the left pin, 0V or GND appears on the right pin. Conversely, when 5V is applied to the right pin, 3.3V appears on the left pin. When 0V or GND is applied to the right pin, 0V or GND appears on the left pin. A single 2N7000 transistor and one 10k resistor is required per I²C pin when connecting a 5V Arduino to the 3.3V pressure sensor module. Only one 10k resistor is needed because the module already has a 10k pull-up resistor on each I²C pin. In the above image the resistor to the left of the vertical dashed line (R1) is found on the pressure sensor module. 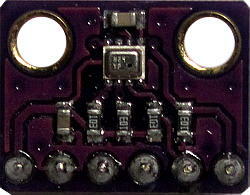 See the GY-BMP280-3.3 pressure sensor module pinout for details of the resistors on the module. The circuit below shows how to wire the pressure sensor module to an Arduino Uno using the I²C pins. Pinout for the 2N7000 N-Channel MOSFET in a TO-92 package is also shown. SPI wiring using software SPI is as follows when using the default pins from the test sketch. Any pins can be used with software SPI, but if they are different from below, then they must be changed in the sketch to match. Hardware SPI pins are a bit awkward to connect to on the Arduino due as they are found on the SPI pins (6 pin header) found near the middle of the board and not on any of the connectors at the edge of the board. The pinout for the SPI header is shown below. SPCK in the image is the same as SCK on the module. MISO is the same as SDO, and MOSI is the same as SDI. Any pin can be used for the chip select (CS or CSB pin on the module), but must be changed accordingly in the Arduino sketch. Refer to the GY-BMP280-3.3 pressure sensor module pinout to see which pins to connect to the Arduino Due SPI header. Again, the module must be powered from the Arduino 3.3V pin and level shifters used for the SPI pins. Either use a level shifter module, or use a transistor level shifter for each SPI line as shown in the Arduino I²C section above. Refer to the GY-BMP280-3.3 pressure sensor module pinout for pin names and numbers of the module. Open the Arduino IDE and use the top menu to navigate to Sketch → Include Library → Manage Libraries... which will open the Library Manager dialog box. In the Library Manager dialog box, enter BMP280 in the filter field to find the BMP280 driver as shown in the image below. Click the Adafruit BMP280 Library item and then use the install button that appears to install it. Also click the I2C-Sensor-Lib iLib item and install it for I²C communications with the BMP280 module. Installation of the BMP280 Arduino driver is shown in the video below. When the BMP280 driver library is installed in the Arduino IDE, a test sketch is available under the Examples menu item that can be used for testing the BMP280 pressure sensor module. Find the test sketch in the Arduino IDE by selecting File → Examples → Adafruit BMP280 Library → bmp280test from the top menu. By default the test sketch uses the I²C interface, so no changes to the sketch are necessary. The BMP280 driver library accesses the sensor at I²C address 0x77, which is the address of the module if the wiring described above is correct. To run the test sketch, simply load it to the Arduino and then open the Arduino IDE Serial Monitor window to see the pressure, altitude and temperature read from the sensor. Make sure that the Serial Monitor window is set to use a baud rate of 9600. Open the same test sketch used for the I²C above in the Arduino IDE by selecting File → Examples → Adafruit BMP280 Library → bmp280test from the top menu. For software SPI, comment out the I2C line near the top of the test sketch and uncomment the line that specifies the software SPI pins as shown in the code below. The default software SPI pins are defined at the top of this code. If you are using different pins, change the pin numbers here. 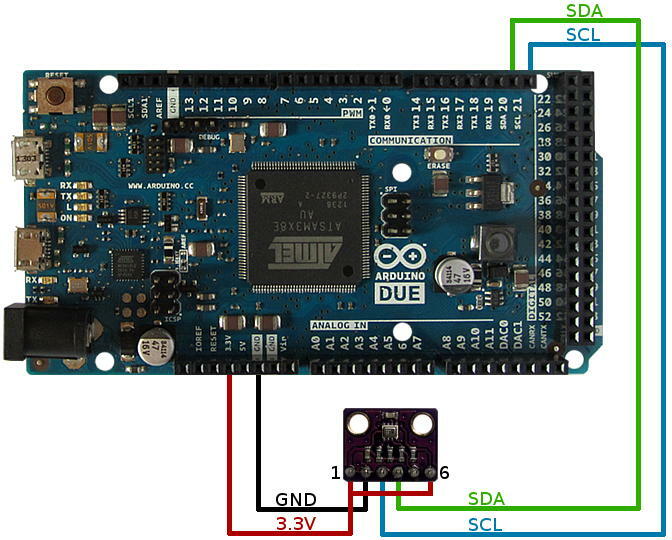 For hardware SPI, the pressure sensor module must be connected to the hardware SPI pins of the Arduino being used. At the top of the test sketch, comment out the I2C line and uncomment the line that specifies only the chip select line as shown in the code below. BMP_CS has a default pin number of 10 as defined near the top of this code. If you are using a different pin for SPI chip select, change it here. The other pin numbers defined at the top of this code are not used when hardware SPI is selected because hardware SPI is only found on specific Arduino pins. Run the test sketch the same way as done for I2C: load it to the Arduino and then open the Arduino IDE Serial Monitor window to see the pressure, altitude and temperature read from the sensor. Make sure that the Serial Monitor window is set to use a baud rate of 9600.